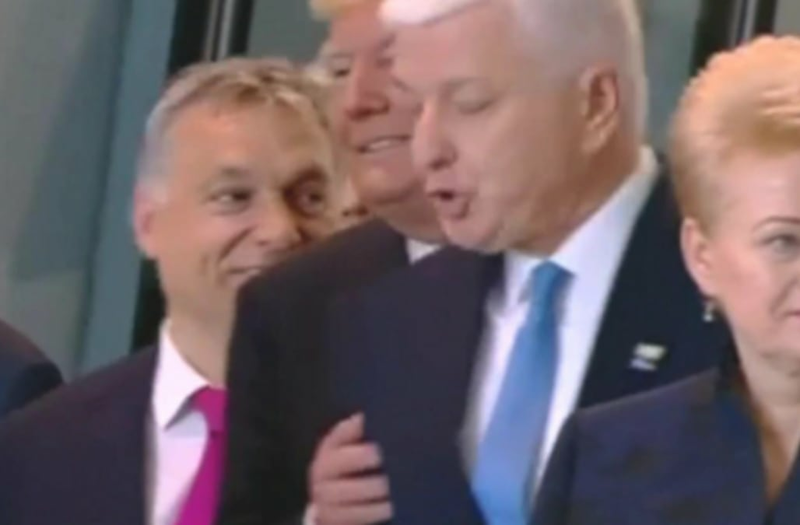 A video that seems to show Donald Trump shoving another world leader out of his way at the NATO summit on Thursday has gone viral all over the world. Footage shows the president pushing Montenegro's prime minister, Dusko Markovic, aside so that he could be at the front of the group. Trump then confidently adjusts his jacket. Though Twitter erupted with outrage in response to the incident, Markovic told reporters after the summit that he didn't really mind the shove at all. "It didn't really register," he said. "I just saw reactions about it on social networks. It is simply a harmless situation." Despite all the social media backlash, Trump was correct to make his way to the front of the photo in the first place. The Associated Press reports that according to the seating chart for the event, the president of the United States is supposed to be at the front of the photo -- a longstanding tradition. Montenegro's representative was supposed to stand in the back of the photo since the country is slated to become NATO's 29th member next month. It seems that the encounter was exaggerated -- perhaps because by the fact that the video surfaced just hours after GOP candidate Greg Gianforte reportedly body-slammed a reporter and broke his glasses in Montana. Markovic used the attention he received after the incident to thank Trump for backing his country's entry into the alliance, the AP reports.